FAQ: Do you have a list of frequently asked questions (FAQ)? Can sun shades be motorized? Are your motors battery operated? Do you have an affordable home automation system controller for blinds and shades? 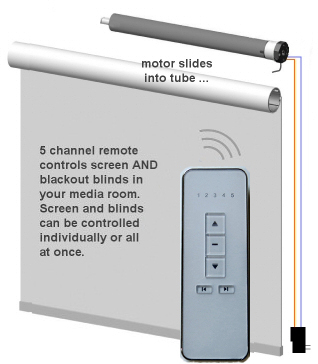 Can I make a remote control home theater screen from an Ikea® roller blind? DC shade motors - can they be reversed with a simple switch? I would like to cover two separate windows but I only need one remote. Can you let me know what I need to operate 2 blind motors with 1 remote? I bought an extra remote control for my radio-equipped motor, one for the entry with the wall holster and one for the coffee table. How can I operate one blind motor with two remotes? I want to install a 10' high shade on my greenhouse window. Will your motors handle this type of installation? I want a remote control system that will control my shades AND some lighting. Will your radio equipped motors do this? Do you sell motorized blinds and shades for Churches and Synagogues? Do you sell motorized blinds and shades for restaurants, coffee shops and diners? Can I use your roller blind motor KIT on my existing Roller Shade? What is the inner profile of the roller I need to purchase on my own? When you say 'radio' motor, is that different from infrared remote control? Are your skylight shades also battery operated? Is your x10 starter kit all I need to get started with a home automation system? Can your LED lights be activated automatically at night with a light sensor switch? LED lighting - can it be used for data? Can your x10 blind and shade home automation system be used for irrigation control? Is there a smart home starter kit for motorized blinds and shades, for home automation? Do you sell motorized blinds and shades in BC? Can adjustable light sensor switches be used to control 12v circuits? Do you have a 12v latching relay? Do you sell motorized blinds and shades in California? Do you sell motorized blinds and shades in New York? Do you sell motorized blinds and shades in Texas? Do you sell motorized blinds and shades in Florida? Do you have a list of all the DIY pages and articles about blind and shade motors on your website?